Early Lindy Hop as danced by "Shorty" George Snowden and his dancers* at the Savoy Ballroom in the 1929 film "After Seben." 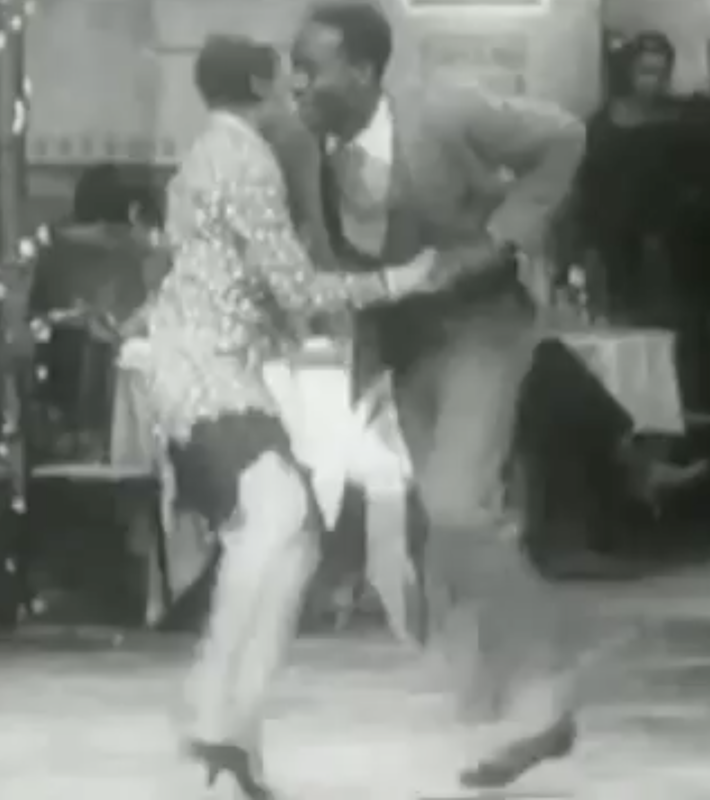 Filmed in 1928, this is Lindy Hop as it was danced in the year that is was given the name "Lindy Hop." 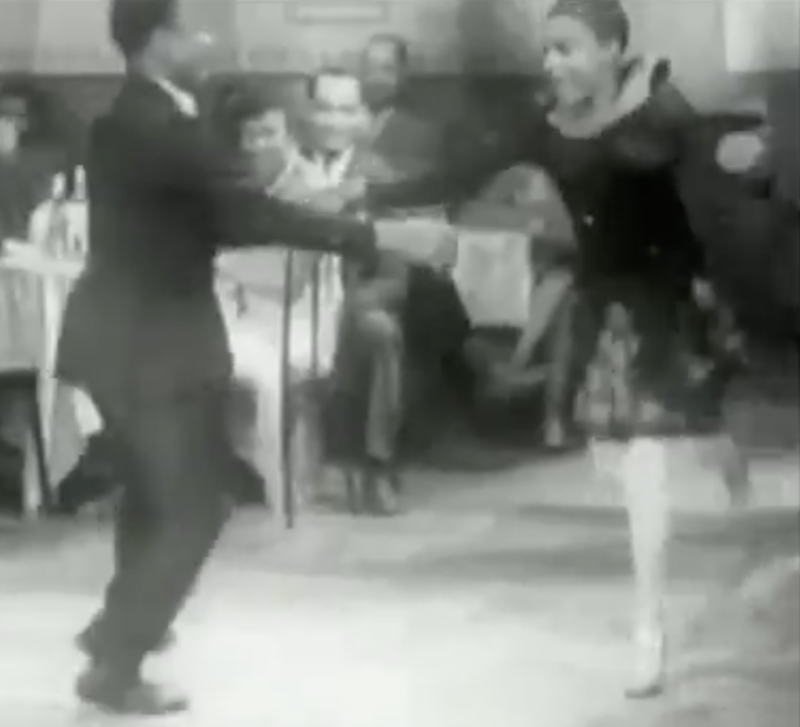 Over the next five years, the music evolved into the more recognizable swung rhythm that characterized the Swing Era, and the single slow step was replaced with a triple step, resulting in the Lindy Hop we know today. * Credited onscreen as "Hotfoot Benny" and "Lizzy Highfly," "Oliver Hemingway" and "Buzzsaw Mamie," "Shorty Stump" and "Liza Underdunk." Note: The names are entirely speculative, based on contemporary variations they resemble. As such, the names are terribly anachronistic, but they serve to show how some of the later swing elements were already present in this early form. Basic: Side, rock-step, side, rock-step, in slow-quick-quick-timing. * Essentially a fast Nightclub Two Step basic. This can turn slightly clockwise. * Musically speaking, Couples #2 and #3 dance it slow-quick-quick, with the side step on the 1. Couple #1 dances quick-quick-slow, with the rock-step on the 1. Lindy Circle: One full rotation clockwise. The first three steps are now like those of a Rotary Waltz. He steps around in front of her (1), and tightly rocks behind (3-4), as she steps straight forward between his feet (1), then runs by his side with a side step with the left and a short cross in front with the right (3-4). The second bar is the same, side, rock-step. Push-Pull: Similar to the Lindy Circle, but push your partner back away from you on the rock step (still in closed position). Sidekick: Same as the Push-Pull, but the Lead kicks to the side on count 7, instead of rocking back. Break Step: Instead of rocking back away from his partner, the Lead breaks straight forward into his partner on 7 as she rocks back. Parallel Break: Instead of rocking back away from his partner, the Lead breaks forward to the right of his partner on 7 as she rocks back, like a Parallel Break in the Latin dances. Scissors: Instead of stepping side right on 5, the Lead twists to his left and crosses his right foot (relatively far) in front of his left. Instead of a rock step, he touches the left toe out to the side with only half weight (or kicks it to the side), ending up with full weight on his right for count 8. Freeze Break: Instead of rocking back away from his partner, the Lead steps side left on count 7 with feet wide apart, freezing in place. During this two-count freeze break, the Follow has the option of kicking between his feet instead of rocking back. Brush Step: Instead of rocking back on 3-4, the Lead brushes his right foot backward past the right side of his left foot, then steps straight into the side step on 5. Swing Kicks: Instead of merely stepping on 1 and 5, kick into the step, as in the later Swing Kicks in Six Count Swing. Unlike the later variation, the timing is the same (as opposed to being delayed one count). Swing Out: Similar to Lindy Circle, but falling away into swing out position on count 6, and taking the rock step there on 7-8 before pulling back into close position for the next count 1. Hand Wave: Similar to the Follow's Hand Wave in later Lindy Hop, the free hand of either dancer can be thrown up in the air during the rock step. Heel Rock: Replace the rock step with a heel rock, back-forward, 7-8, similar to the later Heel Rock in Lindy Hop. This can be done in either single handed swing out position, or with open two hands. Shag Kicks: Instead of rocking back on 7-8, the Follow steps in place 7-8, lifting the feet from the knee behind her, as in Collegiate Shag. This style can also be brought to other steps. Sugar Foot: Instead of rocking back on 7-8, the Follow twists both of her feet to the right (with weight on the right), then to the left (with weight on the left). Brush Off (Shoulder Slide): Similar to the later Waist Slide in Six Count Swing, the Lead turns 3/4 to the right as she travels clockwise behind his back. Catch in closed position for the second rock step. 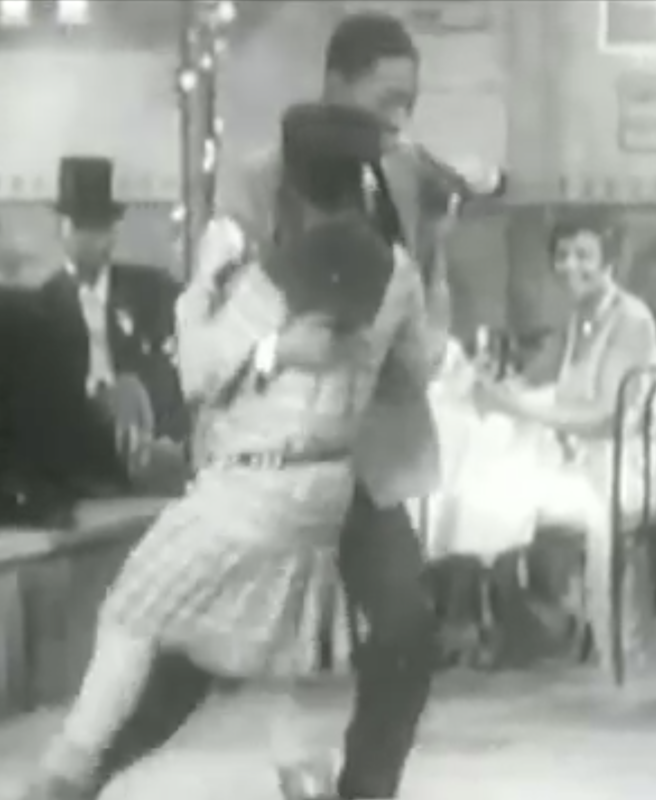 Charleston Kicks: On count 3, he swings his right foot forward, as she swings her right foot back. On count 7, he swings his left foot back as she swings her right foot forward. This can turn in place counter-clockwise. Crossed Kicks: Same as Charleston Kicks, but when the left foot is kicked behind, the kick crosses behind the right. Swing It High: Same as Charleston Kicks, but when the Lead kicks forward, he kicks it high, above the level of the Follow's hip, to the right side of the Follow. Lock Step: This styling can be applied to either of the Charleston Kick variations: when stepping on counts 1 and 5, tightly cross the feet, left in front of right. In the first, he steps side, side, rock-step, while she steps side, side, then does a quick tap of the first her right foot to the right on count 5, giving only partial weight. In addition, on the second count of the first slow step, she kicks her left foot out to the side. Likewise, on the second count of the second slow step, he kicks his right foot out to the side. In the second variation, which they dance only once through at the very end, she also rocks back on 5-6. The kicks out to the side are the same. For both six count variations, the dancers hold each other in a relatively close embrace, and the held hands are held right in front of his left shoulder (see third picture at the top). Other Variations: Many other variations are possible. For example, Couple #3 ends with a Texas Tommy, Death Drop, Free Spin, and Leaping Cake Walk in a side-by-side position. 1920s jazz, around 100 bpm. Music by Chick Webb's band is especially appropriate, given that they were the house band for the Savoy Ballroom at the time. Thanks to Richard Powers, who introduced me to this dance and this video.